This was the challenge that faced the team from Outside Concepts Dandenong. Further adding to the difficulty was the fact the carport had to connect to a house eave that varied by 1.5 metres. The tailor made solution was to combine both a gable and a flat roof area to produce a carport that was both aesthetically pleasing and also practical. The Firmlok steel frame was powder-coated to match the house’s Sandbank colour theme. 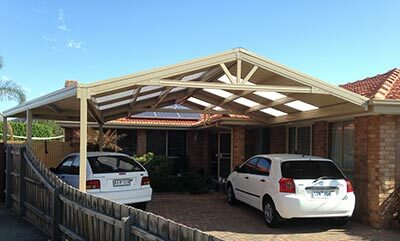 The Colorbond steel Trimdek roof sheets were double sided to ensure that the structure looked great from both the underside and also from the street. Custom made brackets were required to connect the rear quarter of the carport to the house, while standard 22 degree rafter brackets took care of the rest. To create a spacious, light filled area that could easily fit two cars, the design featured no central posts or low gable chord beams, plus several well-placed polycarbonate roof sheets. A carport in a triangular space? Mission accomplished!